The text consists of words beginning with C, all with a K sound, with a minimum of any other words. This is a great idea for teaching beginning readers, and I wish there were more books like this. The illustrations are cute and the story is funny. In other words, it's by the Berenstains. If you like the Berenstains, and if you like picture books with alliterative text, then you have two good reasons to try Berenstain's B Book, 0394823249. 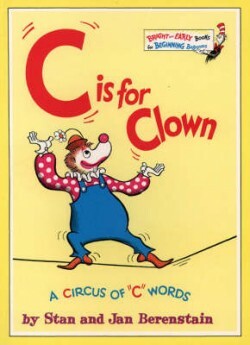 However, don't repeat my mistake by ordering both "Berenstains' C Book" and "C is for Clown." They are both the same book with different titles.